1. Eat more Veggies: Your mom was right, eating vegetables really is a good idea, especially when preparing to shimmy into a bathing suit. Why? There are a couple of reasons. First, veggies are low in calories and high in fiber, which means that you’re filling up without packing on pounds. Second, the vitamins and minerals in fresh vegetables nourish your body and cut down on cravings. Each week, between now and your beach debut, I want you to add 5 minutes to your workouts. Just five more minutes. The slight increase from week to week will hardly be noticeable, but the extra fat burn will pay off nicely. Use these extra five minutes to do intense burst of exercise, such as burpees, squat to presses and walking lunges. Not only will staying extra hydrated help your skin to have a healthy glow, it will also speed up your fat loss efforts. Most of us are walking around in a state of chronic dehydration, which contributes to fatigue, stubborn weight gain and constipation. By drinking more water throughout the day, and by limiting your intake of caffeinated beverages, you’ll become healthier, more radiant, and sexier in that bikini. One of the easiest ways to drop a few inches around your waist before the warm weather hits is to eat low carb before 4pmeach day. This means eating breakfast and lunch that are centered around high quality protein and fat, rather than breads and pastas. If you simply must have your oatmeal or fruit or rice, then eat it for dinner or after an intense workout. If you’re not yet one of my beloved clients, then now is the time. I’d love to get you into beach season shape, and to give you the foundation that will keep you lean and healthy for life. Call or email today and we will get you started this week on an exercise program that will get you back in control of your body. One of the easiest ways to speed up your metabolism, and increase your fat burning, is to get at least eight hours of sleep each night. I know that it’s not always easy to get a full night’s sleep, but the benefits are quite worth it. While you sleep your body works to restore itself, a very important process that assists with your fat loss efforts. Now go to bed already! If you haven’t read my article on hacking your sleep, you can read that here to discover three practical ways to get better sleep starting tonight. 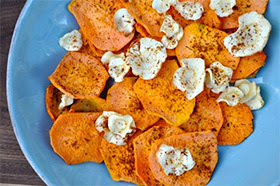 Here’s a nutritious way to enjoy some crunchy, tasty chips. By thinly slicing and baking vegetables, you’re able to get your chip fix without tanking your fitness results. Make a large batch on the weekend and portion your veggie chips out into ziplock bags for the week.